Mary and her child are seated on a precious red cloth under the roof of a stable in ruins. They are visited by the Three Magi who offer their respect to God's son and present gifts of gold, frankincense and myrrh. This beautiful composition is the work of the Dunois Master and his workshop, who likely was the successor and son of the Bedford Master, identified by scholars with Haincelin of Hagenau, documented since 1402. His son, the present artist, is known as Jehan Haincelin ‘enlumineur’, documented as late as 1448-1449 when working for Charles d’Orléans. Under the decaying roof of a decrepit stable, Mary and her child are seated on a precious red cloth. The eldest of the three Magi kneels before them and presents Jesus a casket full of gold coins, in which he reaches with childlike curiosity. The king’s bright red coat is sumptuously trimmed with gold embroidery, pearls and gems and lined with ermine. Of the other two kings, one has removed his crown to pay hommage to the new-born king. Both Magi hold a golden vessel that recalls a ciborium. 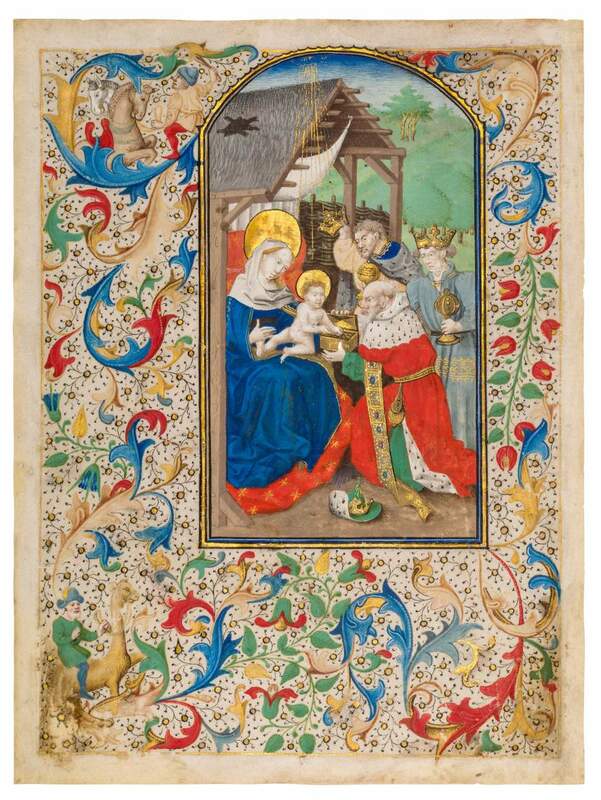 The miniature is surrounded borders that are colourfully adorned with lush acanthus leaves in which a groom disciplines two horses and another man rides a camel, both likely referring to the Magi’s entourage. The Dunois Master who painted this fine scene ran the principal workshop in Paris in the 1430s and 1440s, involving a number of artists. He owes his nickname to Jean of Dunois, natural son of Louis I, Duke of Orléans, for whom he executed a magnificent Book of Hours (now London, British Library, Yates Thompson, ms. 3). The artist captivates the eye with his subtle, soft moulding and evokes a unique atmosphere by experimenting with gradients that create shadow and light. He is renowned for his great sensitivity in orchestrating his arrangements. Today, art-historians ascribe works in the Dunois style both to the Master and to his workshop, since it is virtually impossible to distinguish the master’s touch from his gifted associates. This masterful composition counts among the high end works of this workshop. This exquisite miniature leaf comes from a deluxe Book of Hours and originally would have opened the Sext of the Office of the Virgin. There is no text field incorporated into the composition and the rear of the leaf is blank.